We are a comprehensive manufacturer of products related to cleanliness and beauty. As a company that started out as a chemical product manufacturer in 1949, we have evolved with the time and with the needs of the public to become a cosmetics manufacturer in 1986. 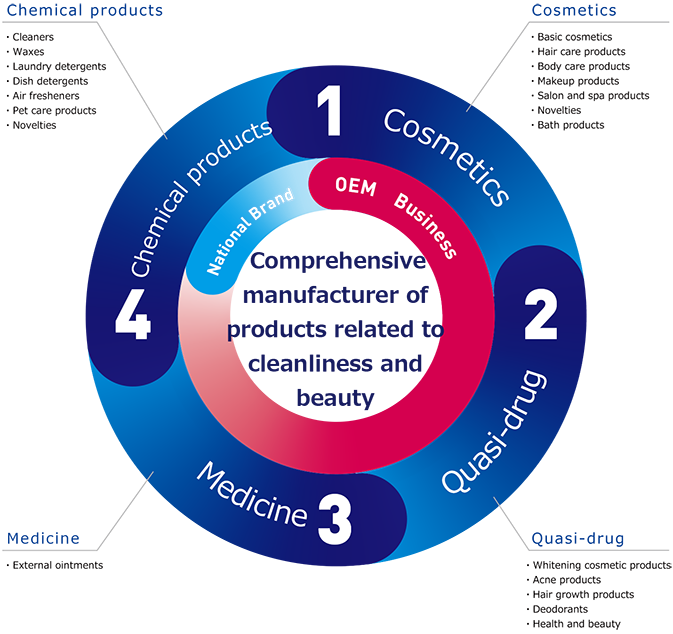 Since then we have expanded from our main market of cosmetics to manufacturer of medicine and quasi-drugs. As a professional OEM and ODM manufacturer, we have maximized our knowledge and know-how from our extensive experiences to create popular products and business opportunities for our customers. With our ability to maneuver through ever changing markets, we can propose new concepts based on our customers’ ideas and needs to quickly turn them into a reality. Our strength is in our ability to be a one-stop finished goods manufacturer. By partnering with domestic and overseas manufacturers of component and raw materials, we are able to present the newest marketing needs to our customers. With our knowledgeable and experienced Research and Development team, we can suggest a product that combines our advanced technological innovation with the latest marketing demands. We manufacture over 50 new products per year. Because we own formulations for over 150 quasi-drugs, we have the flexibility to immediately commercialize products in a timely manner. We can provide the products in an appropriate time without our customers missing any business opportunities. By effectively utilizing our overseas factories and subsidiaries, we can support our customers’ expansion into the global markets. We have ventured our business expansion earlier than most companies in this industry and can pass along the cost advantages to our customers. Our professional and capable staff and network can respond and provide support in many languages. We can advise international prices in both domestic and overseas markets. Safety and reassurance is pursued and guaranteed based on our management system. Manufacturing environment boasting of the world’s highest standard of cleanliness. All our overseas factories are GMP compliant facilities. Our high Japanese standards are implemented in our overseas factories. We offer one-stop services to commercialize your products from small-volume, high variety production to high-volume production. We always lead our customers from the planning to technical support stages. Please feel free to consult us even for small volume startups.